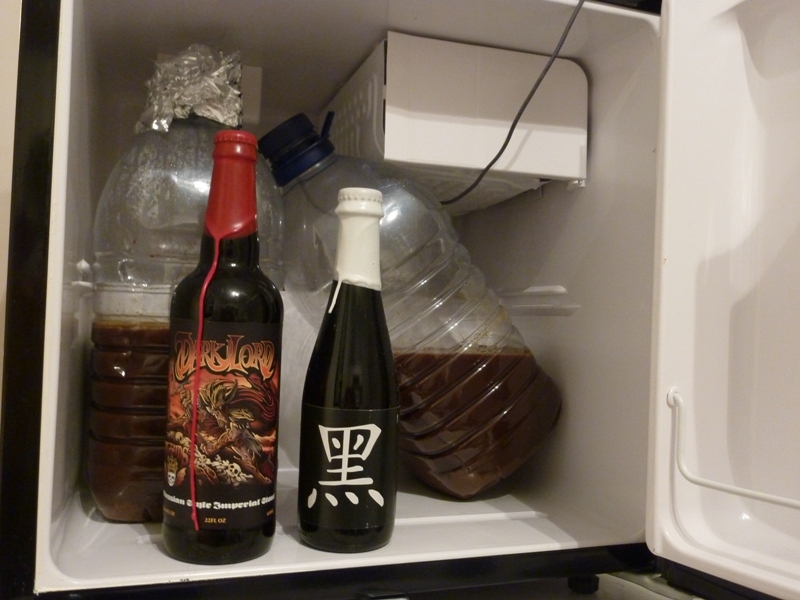 What do Mikkeller Black, Three Floyds Dark Lord and Brewdog Black Tokyo Horizon have in common? They’re all Imperial stouts; plus a bit. 'Black' claims to be the strongest beer in Scandinavia. It’s 17.5% ABV, its fermentation is finished with Champagne yeast and it’s brewed with dark cassonade sugar. 'Black Tokyo Horizon' trails behind at only 17.2% ABV - 17.2! - it brings together the brewing minds behind Brewdog, Mikkeller and Nogne O in a three-way collaboration. And then 'Dark Lord', a beer so sought after you have to buy a ticket to be given the right to then buy a bottle. At 15% ABV you’d be forgiven for calling it an over-achiever in this company, it’s brewed with coffee beans and vanilla and it’s only sold on one day of the year. All of these beers are in excess of what we’d now call an Imperial Stout. They feature massive amounts of alcohol and have huge residual sweetness. They have dense, thick mouthfeel and low carbonation. They’re like the ports and the sherries of the beer world, best drunk in small measures after a meal or in place of dessert. Ladies and Gentlemen .... the Ultra Stout. So here comes the homebrew attempt. This recipe has worked well in the past, the beer tasting good but for the fact it finished very dry and the bitterness was slightly too big. So taking that recipe, I’ve decided to back off on the bittering hops and mash slightly warmer to leave a sweeter finish. I want the coffee flavour to be less pronounced and more integrated, so I’ve changed things up there too. Finally, I also want less roast flavour and more chocolate, so working with the grains I had at the time, I’ve cut down the roast barley and chocolate malt and gone with more moderately kilned grains: Munich, Crystal and some Special B. 15g Simcoe (12.2% alpha), 13g Centennial (11.0% alpha) and 10g Amarillo (6.9% alpha) at 45 minutes from flame out. 6g Amarillo (6.9% alpha) at 35 minutes from flame out. French press coffee made with 720ml wort and 75g Nicaraguan Tres Pueblos, and 3/4 teaspoon vanilla bean paste added at 1 minute from flame out. Pre-boil gravity: 1.069. Mash temperature: 68c. Mash time: 60 minutes. Boil time: 105 minutes. IBUs: 75. Original gravity: 1.119. I want this beer to be sweet and dense, I want it to pour with a caramel head and an oil-like body. I want subtle coffee, liquorice and brown sugar, some alcohol warmth and a gentle prickle of carbonation. Wow, that could turn out to be a special beer! I haven't had a go at a stout with clout yet, but you may just have talked me into it! Something that would be good for drinking by Christmas time. (what was the brew length?) Cheers. Thanks. Christmas is my plan too. Brewlength was about 5 litres. This has every right to ferment really badly and end up as a hot, fusel mess. Will have to wait and see. This looks great! Can't wait to hear how it turns out so I'll know whether or not to steal the recipe. How much US-05 is lots? 20.8 million cells per ml. Off the top of my head, that worked out as 9g. Got my fingers firmly crossed that it ferments cleanly and gets down to 1.030-something. Yep, I think a packet is 11.5g.